The Australian Library and Information Association has chosen Hickory Dickory Dash as the children’s picture book for National Simultaneous Storytime this year. (Catch up with my review HERE.) At 11.00am on Wednesday 23 May, 2018, everyone who wants to will stop what they’re otherwise involved in and share the sheer magic of this funny read-aloud. 2018 sees LIANZA, the Library and Information Association of New Zealand Aotearoa, joining in. Last year’s book was The Cow Tripped Over the Moon, also by Tony Wilson and Laura Wood. You can check out my suggested activities for last year here. * What well-known nursery rhyme is Hickory Dickory Dash based on? 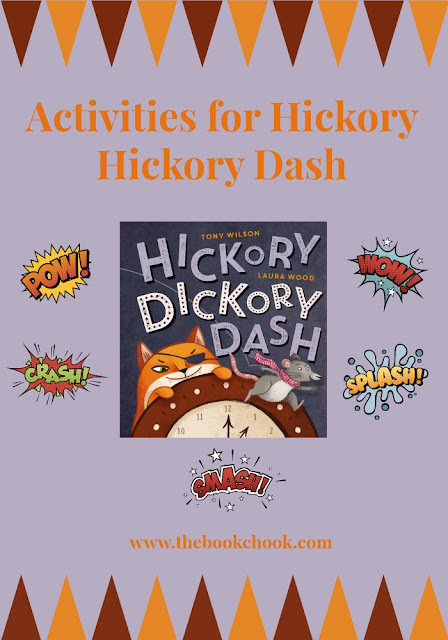 Find multiple verses of Hickory Dickory Dock and printables at DLTK. The dog and the cow had a crash. * Help children to see the rhythm and rhyme patterns in Hickory Dickory Dock. Line 1: 1 x 3-syllable word + 1 x 3-syllable word + 1-syllable word. Lots of hard “ck” sounds. Final word rhymes with final word in Line 2. Line 2: 6 x 1-syllable words. One hard “ck” sound. Final word rhymes with final word in Line 1. Line 3: 4 x 1-syllable words. Final word rhymes with final word in Line 4. Line 4: 4 x 1-syllable words. Final word rhymes with final word in Line 3. Help kids to see the rhythm and rhyme pattern and work together to create a new rhyme based on it. Don’t mess around with a flea! 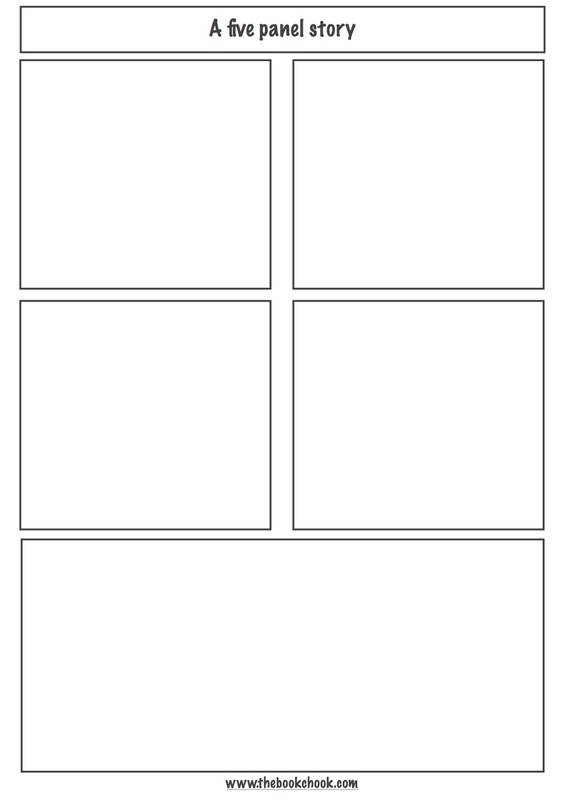 I have a basic five panel template you can download for printing at my website. All my PDFs are available for free to parents, teachers and librarians who want to use them with kids. 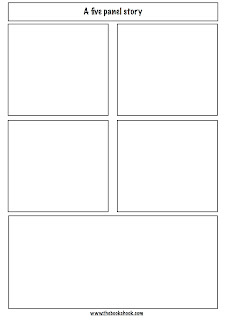 Discuss with children what each line means and what sort of drawings could go in each panel. Remind them that it's their interpretation that counts! * What other stories or songs or rhymes about cats or mice do we know? *Why would a cat chase a mouse? What might happen if the cat met a giant mouse? Draw it then act it out! * Piggybacking on a story or rhyme to create a new one is fascinating to explore, and lots of fun to try our own hand at. Share other books and rhymes with kids that build on something else. Fractured fairytales fall into this category. After the Fall by Dan Santat tells us about a Humpty with a fear of heights - can he conquer his fear? * If you had a pet mouse, what would you call it? Where would it live? What would you do together? Design a mouse house on paper or create a mouse house from junk craft. 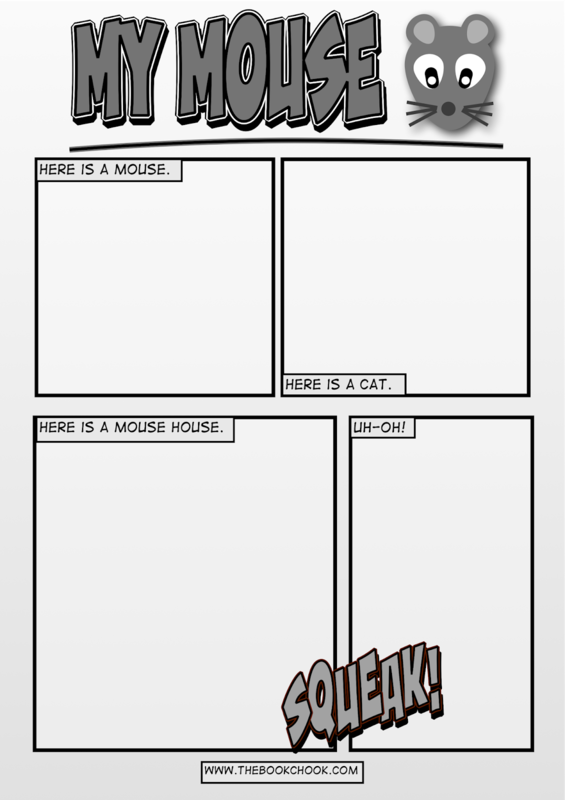 My PDF, My Mouse, encourages kids to imagine a four panel comic story about a mouse, a cat, a mouse house and a problem that might ensue. 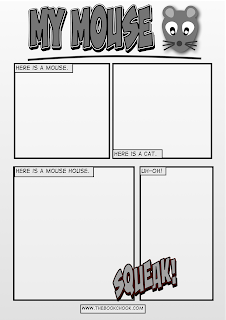 Children read the simple sentences and then draw a mouse, a cat, a mouse house and the resulting problem in each of four panels. * Use the theme in Hickory Dickory Dash to adapt a game that can be played in a group. 1. Consider changing Duck Duck Goose to Mouse, Mouse, Cat. Have children sit in a circle. One child(A) walks around the outside of the circle, tapping each child on the head and repeating “Mouse”, until A suddenly says “Cat”. The Cat jumps up and chases A around the circle with A trying to get back to his place before the Cat tags him. If the Cat tags A, A either sits in the middle of the circle, or rejoins the circle while the Cat is in and the game starts again. 2. You could also adapt What’s the Time, Mr Wolf? to What’s the Time, Madam/Mister Cat? Have the child who is Mister/Madam Cat stand with her back to the other children who are several metres away. They chant “What’s the time, Madam Cat?” and the Cat swings around ferociously, declaring a time eg 3 o’clock, and sending anyone she sees moving back to the start to begin again. The remaining group of kids take three steps forward. The game proceeds with careful kids getting closer to the Cat until she declares “Dinner Time!” and chases them back to the start, trying to tag one who becomes the new cat. * Artists Helping Children have lots of mouse crafts. * Krokotak have some very cute paper mice. * ABC Education has lots of resources on rhyme that might interest teachers. Find Children's Book Reviews on The Book Chook by clicking Reviews in the right sidebar.